My kids don't have school today and so we have gotten? to play Halloween for two days. Yesterday was the school costume parade and every parent in this town attends. I also got to help with Jackson's class party. 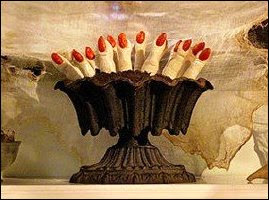 I made the best Halloween severed fingers... Go here for the recipe. In all my preparing, I forgot my camera... yes, it is par for me. So no photos of Meg the Sassy pink kitty or Jacks the really great old woman. Imagine them though...they were great! I will try to remember to snap some pics tonight! Also... while I was away- I got BOO-ED! And I liked it. Darling Tanja boo-ed me! Thanks Tanja. It has been a very festive season and I can't wait to see what you girls pull out of your bag of tricks for the next two biggies coming up. You all amaze me! I have had so many things to be thankful for this week! Here are just a few! 1. My Man!Last week I went to St. George to help tend my sis and her little boy. Meggie went with and the boys were going to come down later- on the weekend. Well...they ended up staying home so Meg and I had a girls weekend with Viv! Anywho- When I got home on Sunday I was sicker that a dog- went to bed. 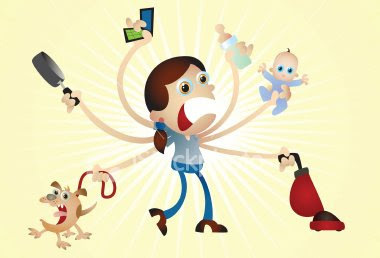 Stayed in bed ALL of Monday, kindof on Tuesday... was in charge of Relief Society on Wednesday... so to say the least my man has been both mother and father and cleaner and cooker for a week now. He is really so great to help me out in whatever I do. I know it is soooo cheezy to have PDA on the blog, but I am really so thankful I found him and he still puts up with me. 2. Sister Brandy is going to be A-OK! She is finally 34 weeks so she is out of real scaryness... she got released from the hospital on Saturday, but she is still on house arrest for 10 more days or so. It was fun to go to St. George and see her- hang out at the hospital, laugh, tend her little boy, Jace ( so dang cute and a total crack up). She is such a cutie... I know she is going stir crazy so if any of you in blogland know her in real life...take her a treat and a magazine. She'll be so happy to see you! 3. Viv- Need I say more? I am so thankful for my rockin' mom. She is the best ol' gal on the block! It was so fun to go to Dixie and just hang out with her. My one sister, Jody was at a motorcycle race and my other sister, Brandy was at the hospital and my sister -in-law, Mindy was in Wyoming with my brother sooo... I had Viv all to myself. I know it sounds so selfish... but we had such a good time. She was hosting a Halloween dinner party for some friends- it was fun to help her get ready for that. We shopped, laughed, stayed up late, laughed, laughed, and laughed some more. We decided that we are both fun seekers to the extreme and it is best that we don't live in the same town. We would be poor, tired, Even more overweight,well-dressed, and divorced if we spent a whole lot of time together She is the best and I had a great time! 4. My Fun Church job- Isn't that an oxymoron? Fun Church Job? Well I am the Enrichment leader and it is really my cup of tea...I mean hot cocoa! I like planning and doing the activities and I really like NOT being the Sunbeams teacher. I work with the greatest lady, Bobbi. She is so fun- I just love to hang out with her and she is like 20 years older than I am. We had a fun time tonight and the best part is... I am done until December! Yahoo! 5. Blogging-I have been a slacker and I have actually missed window peeking on you all. I will get with it and stop by to say hi- soon! I had to take a little break, but I am slowly coming out of it. Thanks for still stopping my to peek in my boring, non-changing window. You make me feel good. I am anxious to see what you all have been up to. I've missed you! I had a really good friend teach me a very important phrase that I try to say, but more importantly believe and follow..."Stress Not" Now that is easier said than done. One of my most favorite tastes of fall is a caramel apple. It is such a memory for me too. 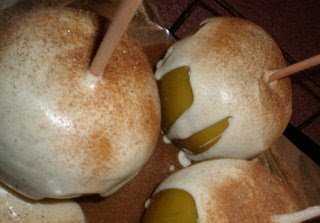 I don't think in the 70's mom's were allowed to just make caramel apples for the fun of it, there was some random rule that said they could only be made in the fall or purchased at lagoon or some other amusement park. At least that was how Viv rolled. 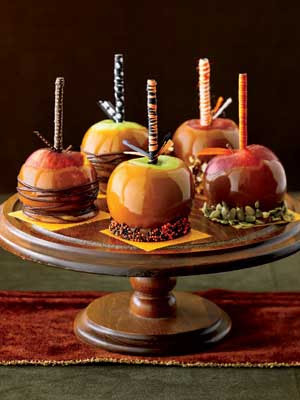 Soooo... caramel apples are a favorite of mine- especially in the autumn. I know there are many wasy to get one...covered in M&Ms , nuts ( heaven forbid), white and milk chocolate, cinnamon, etc...but I am a purest when it comes to the apple caramel. Just caramel- nothing else. Last week while Crystal was in town we went to Gardner Village to see the witches. 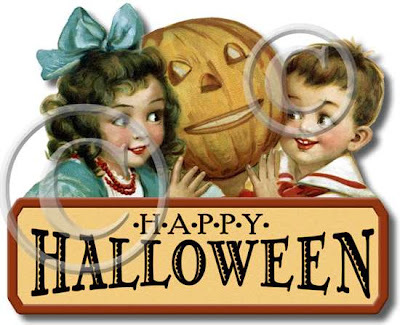 It was a perfect day- kindof chilly, darling witches, pumpkins galore and we topped it off with a caramel apple. It was so good I was sad we had shared one- I could have snarfed my own. I wish I could say that these are my creations below...They're not! Mine would be a picture of bare-naked apples sitting in a puddle of caramel. In the past I have tried and always end up disappointed & driving to the Rocky Mountain Chocolate Factory to get one. This year I am going to try it AGAIN. My darling bloggin' friend Tammy made them and posted the recipe. We'll see how it works- If not, I know the way to the RM Chocolate Factory!p.s. I knot how to decorate the sticks...wrap ribbon up the stick. See... I can embellish, just not make the most important thing. These are Tammy's and you can find out how to make them by clicking here. Wish me luck! If you have been successful at this venture...leave me a comment telling my how to make a mean caramel apple- instead of a clean carameless apple. 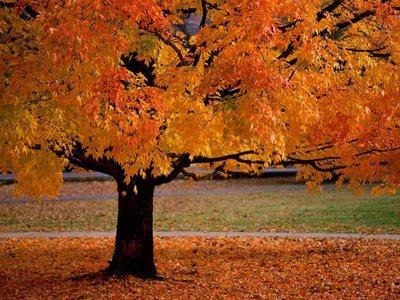 Have a fabulous fall weekend! 1. UEA/ fall recces? I am a little unsure about how I feel about this at this point. We aren't really doing anything spectacular...so we will have to see. I can remember as a kid LOVING this holiday from school. My kids are excited about sleeping in and no homework. Frightmares is always a good activity during October... we'll have to see! 2. Modern times- It was the best of times, it was the worst of times! I am glad to live in a modern world with modern healthcare. My sister, Brandy, has been taken off house arrest (bedrest), and has been fully admitted to the hospital. She is 32.5 weeks pregnant. They need her to be at least 34 weeks so... she is there until she has him. I know she is going crazy...but I am so glad that modern medicine can help stop her labor. 3. Good Friends- The other night my friend, Collette, and I were making stars and we had such a fun time. We laughed so hard... I don't know if it was from sleep deprivation, glue fumes, spray paint fumes, or inhaled glitter...but we had a great time. The next morning the stars even looked good. A project is always more fun with someone to chat and laugh with. 4. Projects- I am in the middle of several crazy projects. I think my hyperactivity is getting the best of me lately. I am going to push to get a few things done and then I am going to read a book or just sit. Until then... there is no rest for the wicked. 6. Bloggin' Friends- Thanks for reading my blog and making comments... I have been kindof a blurking slacker or in blog lingo... a blacker -because I haven't been commenting very much on your blog. I am sorry and I will resume next week-0 FOR SURE! 7. Another excuse to party...Twilight Tailgate pary- Let's have a blog fest at the movie. Grab your real life friends and mix in the blogging friends and have a twilight/ girlfriend extravaganza! I know Chalyce, Hannie, & Olivia are drumming up some fabulous prizes so lets all go party with them...November 20th, 11:00, Jordan Commons, click here for details. Christmas, Turkeys, Birthdays, & Twilight... all wrapped into one! This is going to be quite the modge podge post... stick it all together and add some glitter and it is done! I have got a few items of business to shout out! This close up is to show you all the cute paper and ribbon and GLITTER! Next: The Queen of Hearing your confessions is having a spectacular give-away! She is trying to buy your love with a "fowl" seasonal, a gift card, & a CHERELLA bag! Click here to enter. Good News: There is this little movie coming out soon called TWILIGHT! The Babes at Private Design ( AKA Chalyce, Hannie, & Olivia) are hosting a big huge Twilight Tailgate Party on opening night. Grab the girlfriends and see the vampire splendor together. It is being held at Jordan Commons on November 20th at 11:00 p.m. Tickets are $15.00- and that includes the total party, entry into many drawings, and prizes... Click here for info! And last...but certainly not least... Vanessa is giving prizes away for HER birthday! WOO-HOO! Click here to enter her birthday presents for you give-away! The Witches' Brew... Part two! Where to start? The food? The AMAZING costumes? The FUN? Last Thursday we had the greatest witches brew of our lives ( That was easy... it was the first). I was in shock and awe at the costumes... I have never seen so many feather boas in my life...green, orange, black, red, purple, zebra. 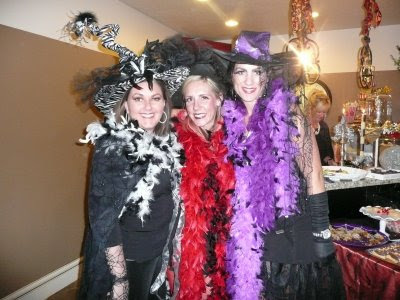 The most colorful witches ever! There were even darling little server witches ( Tonia's daughters and friends...Meg stayed home because I didn't want to have to hurry to get her home on a school-night- I wanted to PARTY! It was so decorated and done Over the Tipsy Top... Here is one photo of the glittered glasses that everyone drank out of... real glass... real glitter- Only Tonia! We played games and gave prizes and laughed and ate and just enjoyed being all dressed up and with other girlfriend witches! 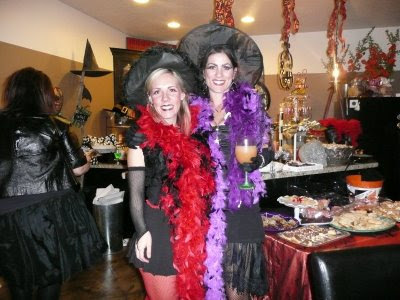 There were even some witches that were scantily clad... Chalyce and Hannie were the hot witches! OHHHH...to be young and hot! I put this picture with myself ( in my new favorite zebra witch hat) and the witches of the evening...if you get my drift. They were hilarious! Thanks for being such good sports! Here are a few more shots of some of the great costumes. I was so impressed with all the costumes and all the great food. We assigned the food to people and were AMAZED at the treats that showed up! This is something I want to do every year... hopefully Tonia will join in again. 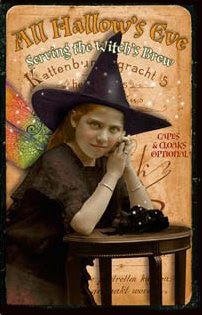 She is the most spooktacular witch of all. She takes glam to Halloween like nobody's business! Thanks Tonia for your house and all your work and your friends and just being such a great friend. 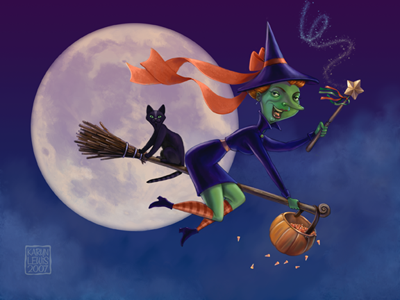 Fabulous Fall Friday...Only WITCHES dressed like witches are allowed to enter! Fabulous Fall Friday...Witches Brew! Last night Tonia and I held our first annual witches brew! I got to the party and realized my camera was missing the memory card so... I don't have a lot of photos, but I will get copies this weekend. This post was to show the invitation and a photo of Tonia, Marla, Crystal ( The only witch that flew in on her broom all the way from Idaho) and I. We were sassy, funky, and fabulous witches. We had so much fun. 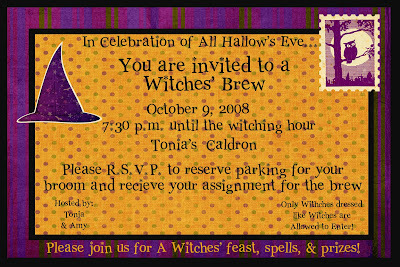 This was the invitation... we invited about 50 of our favorite witches and most all of them came. Crystal, Me, Tonia, & Marla..Which Witch is Which? I will have all the tricks and treats of the party.. along with photos on Monday! You won't believe the costumes and treats that everyone brewed up. AMAZING! Really... Here are the Winners! The Pressure of the cuteness! I wanted to post the winners in some really cute and creative way... but I am really a right brained person... because the pressure of the task just ruined it and now I am stuck announcing the winners in a really LAME way...just writing their names! Oh... p.s. I tried that random,org and it worked,,,I just couldn't figure out how to publish the official findings. I did use it...just can't prove it. Thanks for always being such a great supporter of my little blog. I love yours and have enjoyed getting to know you! I consider you a total friend and we've never even met! You two are new to me because of this giveaway...yeah! So thanks for coming over... I hope you'll come back for free! Please e-mail me your information so I can get your surprise package to you ASAP! P.S. to everyone else who entered...thanks a ton! I wish I could send you all a prize! Some of you are faithful commenters... Thanks! Some of you are new... I hope you'll come back! The Weather is finally going to turn fallish tomorrow! YEAH! 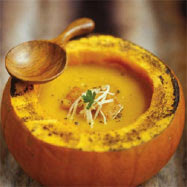 Here are some ideas for the best food for fall...SOUP! 15 baby carrots cut in fourths. Mrs. Dash, garlic powder, and pepper to taste. Boil the chicken in water, bouillon, and a few shakes of garlic powder, pepper, and Mrs. Dash in a large soup pan. Remove Chicken after it is boiled...but, keep the broth. Add more water if the water is low. Add carrots, celery and potatoes and pasta. When pasta is almost done add chicken. In another bowl mix melted butter, flour and warmed canned milk and milk. Mix until all lumps are gone. Add to soup mix and boil to thicken. This soup tends to really thicken up as it cools. ! 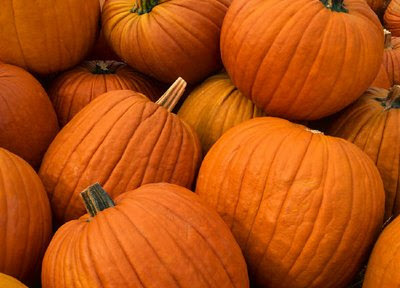 One of the greatest things about fall is PUMPKINS! They are so versatile! Two years ago I had a party and served the chili and soups in cleaned out pumpkin pie ( the little ones) pumpkins. It is an idea that I got from Tonia... and it was a fun way to celebrate the season! I did have carpel tunnel from cleaning 25 pumpkins out, but it was well worth it. Another idea... Beef stew in a baked pumpkin! Make the stew ( or any hearty soup) and then put in a cleaned out pumpkin. Make the stew or any other soup you would like and then put it in a pumpkin that has been cleaned and rubbed down with cooking oil. This makes the outside shiny and gives some protection. Cook it for about an hour or until the sides get a little soft. Don't overcook or it won't support the soup. This is so yummy because the pumpkin cooks and you get a little pumpkin taste with the soup...plus you look like Betty Freakin' Crocker! There are a lot of recipes on the internet for pumpkin soups, etc... I have never tried any of them, but they do look yum! Play with the pumpkins...use them for dip bowls, soup bowls, anything- Have fun. 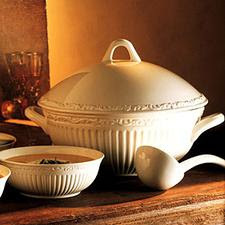 This is the best time of year to have more serving dishes...You don't have to store them, because you just throw them away when you're done! 1- All my bloogin' buddies! Holy Cow! I am so glad that I am still able to buy your love! It made me feel so good to read all your enthusiastic comments for my give-away. I guess I had better put together something "real nice" for the proize! Just kidding I already know what it is! But thanks a ton for shouting me out...commenting on my blog... being more than just fun, time wasting hobby!. You are so much more! 2. The school computer system that can allow me to check on Mitch's grades at any time. I have to somewhat badger... I mean support him in his school endeavors. I am glad the teachers get their scores in and I can see just how well he is doing. 3. Good friends- Today I had the great opportunity to hang out with some AMAZING old friends. I can neither confirm nor deny the location of this reunion, but it was great to hang out with the forever entertaining Mindi ( that I see all the time... so really this is old hat-KIDDING!) AND our world famous designer friend of CHERELLA, Cheryl Forrester. We talked and laughed and had such a good time. We were three CRAZY girls at one time and now we have 10 kids between us. YIKES! It was such a spontaneous meeting and one that I absolutely enjoyed to the fullest! It was a beautiful fall day, great treats, and fabulous friends! Cheryl even brought prizes... more on that later! Loved this day! 4. Next week my man is going to be working from home because his new office isn't quite ready! I love it when he works from home. I can usually talk him into taking me to lunch..the down side is that I can't watch cartoons and lay on the couch drinking Diet Pepsi like Meg thinks I do... He has traveled quite a bit lately so it will be nice to just have him home. 5. My sisters... I have really been missing my sisters lately. My youngest sister, Brandy, is 30 weeks pregnant and has had to be put on House Arrest ( not the real criminal kind...) because she is going into labor too early. She has a little 2 year old tornado named Jace and has had to rely on my mom, sister, and sister-in-law. I wish I could be closer to help! It makes me happy to know that she has them to help her. Viv, Jody, & Mindy are so helpful and kind to take care of her. Brandy is very independent so it is hard to accept the help. I have great women in my life... I miss them! 6. Fall is here! Did I mention that I love it? It is here...OCTOBER! I hope it finally brings fall-like weather. 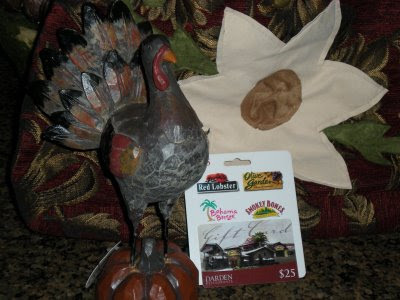 I have got the pumpkins going on and to further get into the spirit I am having a Fabulous Fall Give-away! Last time I did a give-away I got a few new blurkers to comment and they turned out to be some of my total blesbians... ( Tanja, Tammy, Devri) There is a twist... the prize is a surprise! Let me just say... it is something you have seen on my blog, something having to do with fall and/or Halloween & something I LOVE! You know the drill...comment for one entry...shout me out for two... I am having this go until Monday..October 6th. It is only 5 days...so get with it and comment! p.s.s. If I get more than 100 comments ...I am going to give more than one prize! SO... There are many ways to win and I think you will like the SURPRISE! This is my story! I am married to my best friend- A real hottie that totally cracks me up! I have three great kids! I am a part-time English teacher at Legacy Junior HIgh. I love aprons ( making them, wearing them, having them, giving them) reading, entertaining, & laughing....I also have 15 different sets of dishes- it's a problem! I love to plan and throw parties. My motto in life is: Life is a party... and I am hosting!